Here is some help regarding payday filing errors, messages and more. Error: This file has some errors - you cannot file for [date] as the initial filing has not been made. 1. Ensure you have registered with IRD for payday filing. 3. Ensure you are aware of our payday filing tutorial which can be found here. You can follow this when you do your payday filing - either on screen, or by printing the PDF version. 4. 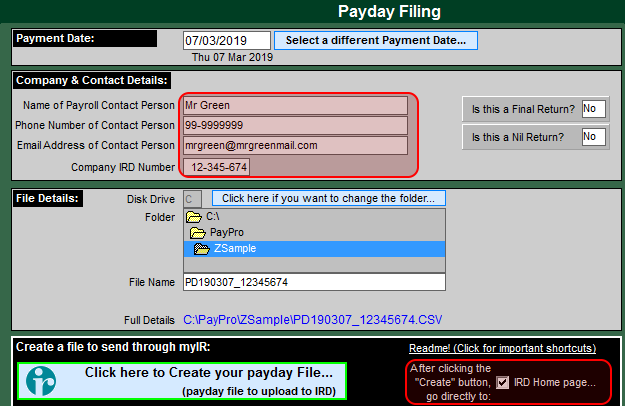 Ensure you have completed your pay run (that is, finalised the pay by using Update Totals) before trying to create the file for payday filing. If you don't, the file will be blank! 5. Ensure the name and phone number of the contact person are entered - see image below. The phone number can be your work number. 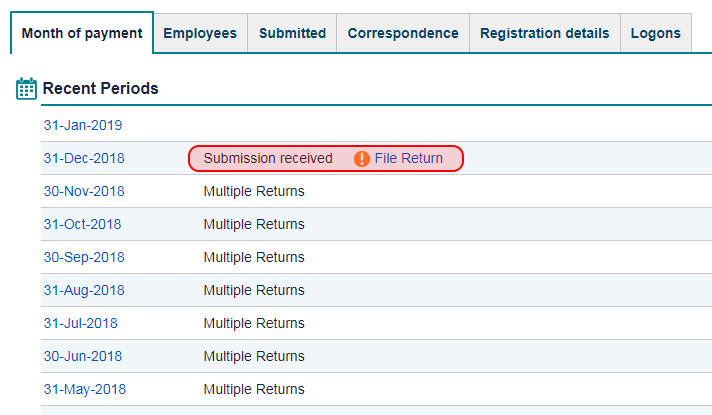 IRD requires this information, and will report an error if you don't enter something here. If the email address is blank, you will not get an error. 6. 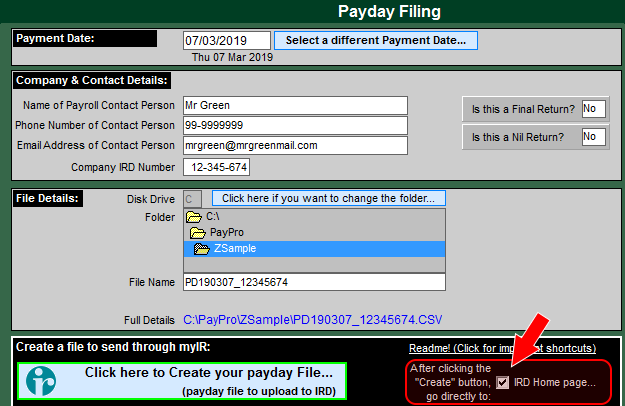 If you want Payroll Pro to go to the IRD Home Page after the file has been created, ensure the option is ticked (see image above). 7. If you have any problems with Payroll Pro taking you to the IRD Home Page, you can un-tick the option (in item 6 above) and just use your internet browser to go there. The page is https://www.ird.govt.nz/, and you can click the LOGIN button on that page. Ensure you have registered with IRD for payday filing so they are aware of when you are changing. If you start payday filing from the beginning of March, then you only need to send IRD the IR348 for the month of February. This will contain all the employee information that the IRD requires for February. You will also need to file the IR345 for February, which contains the amount to pay the IRD, and you will still just pay this by the 20th of the month as usual. If you are a large employer, then you will still need to send two IR345's in for February as you have in the past, with the same due dates, and the same payment dates. Then in March, you will send in the payday file after each pay, so no longer need to send an IR348. 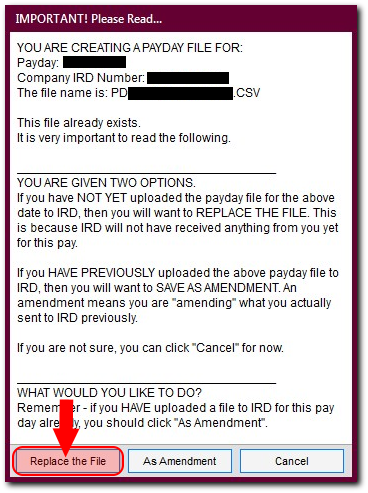 The payday files will have all the information needed by IRD for March. Payment dates to IRD will not change – this will continue as in the old system. > file the IR348 (Employer Monthly Schedule) for the pays in February. > and file the IR345 (Employer Deductions) for the pays in February. During April – pay IRD as you have in the past. Note: dates for paying the IRD have not changed – so these are the same whether you are a small employer or a large employer. > No IR348 (Employer Monthly Schedule) is needed for the pays in March. > No IR345 (Employer Deductions) is needed for the pays in March. 1. In myIR, you can just go to "My Business", and select the usual options, and as long as you haven't done any word processing (eg editing Word documents, spreadsheets etc) since creating the file in Payroll Pro, it should will still be in Windows clipboard, ready to paste into the box. 2. OR, in myIR in the payday filing section, you can try manually locating the file when you click "Choose File". In the above, you will click "Replace the File" instead of "As Amendment" since you won't have uploaded the file to IRD yet, so there is nothing to amend. This error may occur when myIR is busy, and usually it should only be unavailable for only a few seconds. Usually after waiting 10 seconds or so the page will appear. If it persists, we would suggest phoning IRD. If the problem continues, you can try "un-ticking" the option to go to the IRD Home Page in Payroll Pro. See the image below for details - this is shown to the lower right with a tick in it - clicking this will remove the tick. Then, just use your internet browser to go to IRD - the page is https://www.ird.govt.nz/, and you can click the LOGIN button on that page when you get there. The File Name details will still be in your Windows Clipboard if you do this (as long as you have not done any word processing etc and used copy or cut commands), so you can still use "paste" instead of searching for the file. Your file is probably OK, despite the message! This message shown in the image below does not necessarily mean there are errors in your file! The file should actually be ok, but you might be trying to upload it in the wrong section. * If you try to upload your payday file under the section "File transfer payday amendments". "File transfer payday amendments" should only be used if you had uploaded your payday file for this payday previously, and then made some change to the pay, and then want to upload an amended payday file. So, if you are not sending an amendment, you should use "File transfer payday schedules" to upload your payday file. * If you try to upload an amendment file under the section "File transfer payday schedules". You should use "File transfer payday amendments" to upload an amended payday file. So if this problem occurs, you do not need to create the file in Payroll Pro again. Just click Cancel as shown in the image above, and then select the correct option - one of the two circled in the image below. Note that the order of these options changed in February 2019, so this can lead to users accidentally clicking the wrong option. The order may change again at a later stage. NOTE: It is OK to create the file in Payroll Pro again, but if you do, then select "As Amendment" or select "Replace the File", depending on whether you have filed it previously or not. That is: "As Amendment" if you have already filed for the payday, but changed the pay and need to send an amendment to IRD. Or: "Replace the File" if you have not filed for the payday yet. This also covers the topic "Problems with amendments - filing for the same date a second time after altering a previous pay"
This message shown in the image below does not necessarily mean there are errors in your file! 1. You have not uploaded the payday file yet, so do not need to upload as an amendment. If this is the case, click Cancel, go back to Payroll Pro, create the file again (as a replacement not an amendment), and upload as a payday file (not an amendment). 2. You have uploaded the payday file, and are trying to send an amendment before myIR has recognised the original file. You may need to phone IRD to find out the best course of action here. This message means you have already uploaded the file. If you are certain you haven't uploaded it, then you will need to phone IRD to see why this message is appearing. If you realise that you had already uploaded the file then you can just click OK then Cancel, and don't need to do anything else. HOWEVER, if you had amended the pay and meant to create an amended file, please go back into Payroll Pro and attempt to create the file again, this time choosing "As Amendment". Your file is probably OK, and Payroll Pro is probably OK too, despite the message! This message is misleading (telling you to update your software) and probably not correct. IRD are working to change this message. You do not need to update your software. Instead, you have probably just tried to upload your file into the wrong section. MyIR may show this message if you try to upload your file in the wrong place. Do not click "Save Draft" ! Instead, you should click Cancel and then choose the correct section. You can probably ignore it if you are sure you have filed all your returns. Clicking this link does not appear to take you anywhere logical. BUT if you are in any doubt at all, please phone IRD regarding this. If your letter does not open automatically, click here. Then click where it says "click here". If you experience further problems in this area you will need to phone IRD (this is outside the control of Payroll Pro).